Crytek says a report of an upcoming patch that will enable DirectX 11 support in Crysis 2 is unconfirmed and inaccurate. 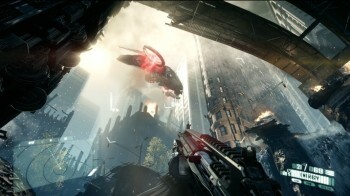 Last week, German site PC-Max [via Maximum PC] reported that a patch was being readied for the PC version of Crysis 2 that would enable support for DirectX 11 and add an "Advanced Graphics" menu allowing for finely-tuned performance tweaks. It was good news for those with the latest and greatest cutting-edge hardware, but there's one minor problem: according to Crytek, it ain't so. "No patch was ever confirmed, I have no idea why this website even posted such information," Crytek community rep "Cry-Tom" wrote in a thread asking about the patch. "This thread is locked just the same as the others for trying to spread inaccurate information. When there are any big announcements regarding Crysis 2 they will be posted on MyCrysis, if you read something about a patch for example, but don't see it on MyCrysis.com, then it isn't genuine." PC-Max also cited a tweet from Crytek's principal R&D graphics programmer Tiago Sousa commenting on the "highly anticipated" patch, but there's no sign of such a tweet now. Whatever's going on, it's obviously not a flat-out denial that a DirectX 11 patch exists, just that it's not going to be available today, as PC-Max reported. Hardware enthusiast types may still get their giggles, they'll just have to wait awhile before it happens.